i'm not sure yet if this will become a constant feature i'll write on, but "becoming bostonian" seemed like a good way to label the little discoveries in this here (still) new city of mine. many of these will probably be all-too familiar to true residents, but hey - new to me is what counts. onward! today i decided to take a different route to work, to walk on foot rather than take the T one stop to back bay station. 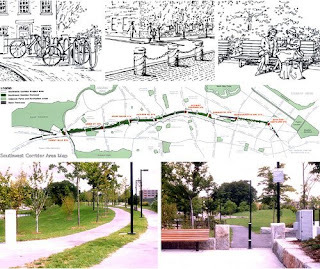 i had heard about the southwest corridor park just the other day from one of my coworkers, but never realized that one of the access points was directly across the street from the mass ave T stop. it was supposed to have been the southwest expressway, but thank God that never went through - stepping into it was like finding a peaceful, (non-yello) brick-lined oasis as a relief to crazed boston drivers. the park itself stretches from back bay station all the way out to forest hills along the orange line. although you can still hear and feel the periodic rumble of the train underneath, it's still pretty quiet, with flowers and trees planted along the way. walking along it this morning felt like the first time i found the promenade plantee in paris - almost a secret route through the heart of town (cheesy i know...a "secret" thousands of other commuters, dog walkers, and bikers already know about). makes for an easy 4.7 mile bike ride or long walk on a weekend. so, why did i take the T again? what about the working women?